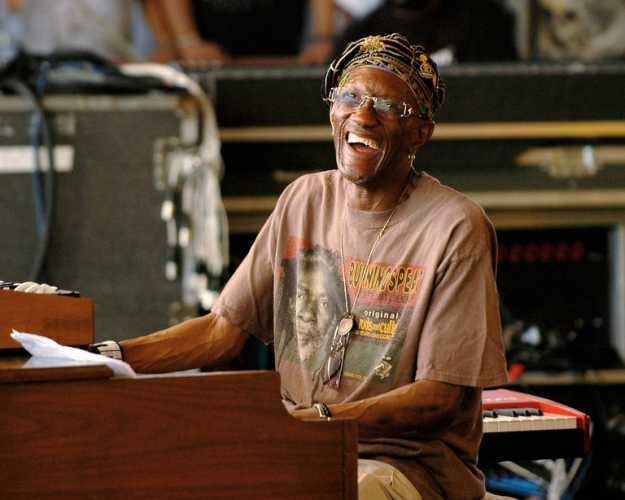 Bernie Worrell performing with Leo Nocentelli’s Rare Funk Gathering at the New Orleans Jazz & Heritage Festival in 2008. Bernie Worrell, the keyboardist whose anarchic solos and Moog synthesizer bass lines with Parliament-Funkadelic indelibly changed the sound of funk and hip-hop, died on Friday at his home in Everson, Wash. He was 72. His wife, Judie Worrell, confirmed his death. He was told in January that he had late-stage lung cancer. Mr. Worrell was the kind of sideman who is as influential as some bandleaders. A broadly grounded musician, he grew up playing classical piano and was adept at jazz, rock and R&B. His stint in the 1970s as keyboardist and music director in groups led by George Clinton — Parliament, Funkadelic and their eventual merged identity of Parliament-Funkadelic, or P-Funk — taught generations of musicians and listeners that synthetic sounds could be earthy and untamed. Mr. Worrell reached a new audience in the early 1980s as a member of the expanded Talking Heads, whose 1983 tour was documented in Jonathan Demme’s film “Stop Making Sense.” In the 1990s, Mr. Worrell’s synthesizer lines for P-Funk songs were widely recycled as hip-hop tracks, becoming the foundation for the West Coast rap — sometimes called G-Funk — of Snoop Doggy Dogg and Dr. Dre. Mr. Worrell was inducted into the Rock and Roll Hall of Fame with Parliament-Funkadelic in 1997. His inventory of sounds was more like a rain forest than a library. His synthesizer lines whistled, gurgled, cackled, squished, snickered and belched; their pitches might wriggle, and their tones could bristle and bite. There was humor in them, along with ingenuity, defiance, raunch and joy. Mr. Worrell’s best-known innovation was the bass line he played on three connected Minimoog synthesizers in the 1978 Parliament song “Flash Light.” It had a descending and ascending chromatic line with a meaty tone and a certain swagger, an approach that would spread through funk, new wave, electro, synth-pop and countless other iterations. Many Parliament recordings from the 1970s, like “Aqua Boogie,” another song that would be widely sampled in hip-hop, revolve around the multiple, constantly surprising keyboard parts Mr. Worrell devised. He played, and played with, whatever technology was available to him at the time: piano, electric piano, clavinet, Hammond organ, as well as Moog, ARP, Yamaha and Prophet synthesizers. What he brought to every piece of technology was a human element: quirks and syncopations, complex structures and outbursts of anarchy. His oft-repeated advice to young musicians was “hands on” — to keep the human touch in music rather than depending on machines. Mr. Worrell was born on April 19, 1944, in Long Branch, N.J., and grew up in Plainfield, N.J. His father was a truck driver; his mother sang in church choirs and taught him his first scale on the piano. He started classical piano lessons at 3, composed a piano concerto when he was 8 and performed with the Washington Symphony Orchestra of Pennsylvania when he was 10. He graduated from the New England Conservatory of Music in Boston in 1967. (The conservatory gave him an honorary doctorate in May.) While in college, he played organ in an Episcopal church, backed a local group called Chubby and the Turnpikes (the vocal ensemble that would become the hit disco act Tavares), and accompanied a Jewish men’s chorus. Mr. Worrell had been the musical director for the R&B singer Maxine Brown when he joined Mr. Clinton, whose doo-wop group, the Parliaments, was originally from Plainfield. The Parliaments had moved to Detroit and were becoming two intertwined acts, Parliament and Funkadelic, recording for different labels. With Mr. Clinton’s high-concept wordplay, the rhythm section’s deep grooves and Mr. Worrell’s sonic zingers, P-Funk brought Afro-Futurism to dance floors. While living in Detroit, Mr. Worrell also did studio work with P-Funk’s rivals. He played keyboard on hits like Freda Payne’s “Band of Gold” and Johnnie Taylor’s “Disco Lady.” He also made his first solo album, “All the Woo in the World,” in 1978.
Business disputes led Mr. Worrell to leave Parliament-Funkadelic as the 1970s ended, though in later years he collaborated with various P-Funk associates, including Mr. Clinton’s P-Funk All-Stars. He and his wife, Judie Worrell, had long contended that he did not receive what he had earned for the songs he wrote in Parliament-Funkadelic and for their later use as samples in hip-hop songs. The publishing rights have been under legal dispute for many years. Besides her, his survivors also include a son, Bassl. After working with P-Funk and the Talking Heads, Mr. Worrell was in demand across the musical spectrum. He worked with the producer Bill Laswell on funk, jazz, African and avant-garde music, and with the bassist and songwriter Jack Bruce of Cream. He sat in with jam bands like Gov’t Mule, and, with Les Claypool of Primus and the guitarist Buckethead, formed the group Colonel Claypool’s Bucket of Bernie Brains. Mike Gordon of Phish and Warren Haynes of Gov’t Mule appeared on Mr. Worrell’s 2007 solo album, “Improviscario.” Mr. Worrell played on Keith Richards’s first solo album, “Talk Is Cheap,” and toured with the Pretenders. He also joined the rapper Mos Def’s rock band, Black Jack Johnson. When “Late Show With David Letterman” began its run on CBS, Mr. Worrell was a member of the house band, the CBS Orchestra with Paul Shaffer. His last solo album, “Retrospectives,” released in 2016, revisited his favorite P-Funk compositions as instrumentals. After Mr. Worrell learned he had cancer, a benefit and tribute concert was held on April 4 featuring admirers and collaborators from throughout Mr. Worrell’s career. It ran overtime with a P-Funk reunion.